How To Hunt Skunks Without Being Sprayed At? Small animals like muskrat, raccoon, and skunks can really cause a nuisance around your neighborhood, am I right? Are you constantly struggling with one failed solution after another to get rid of these little animals? So what really is the right way and how to hunt skunks properly? Skunk hunting, especially in the skunk hunting season, is considered to be the simplest form of small game hunting. 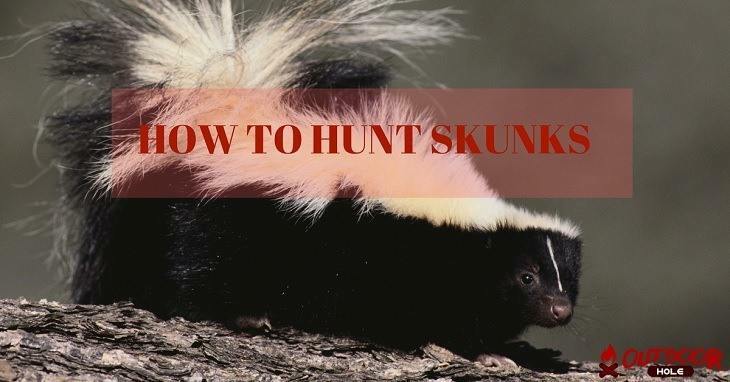 When you know that the skunk population in your area is higher than it should be, then isn’t it better to also know the best way to hunt skunks? Otherwise, all that you will be doing is stepping on skunks every single time you leave your house to get to work. And you don’t want to do that, do you? 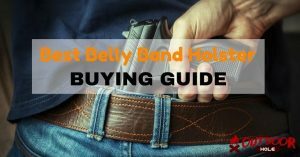 So let’s learn the best way to hunt skunks in order to make your surrounding environment a much safer and less inhospitable place for you and your pets to live in. Skunk hunting tips 101; the bait should have a very strong odor. The most effective skunk bait is either cat food or sardines. In fact, many small game hunters use either of the two baits to achieve positive outcomes. You will find many kinds of traps on the market when it comes to skunk hunting. But not all of them are very effective. The two most commonly used traps are live and kill. And that’s mainly because of the kind of effectiveness they offer when you want to hunt skunks. 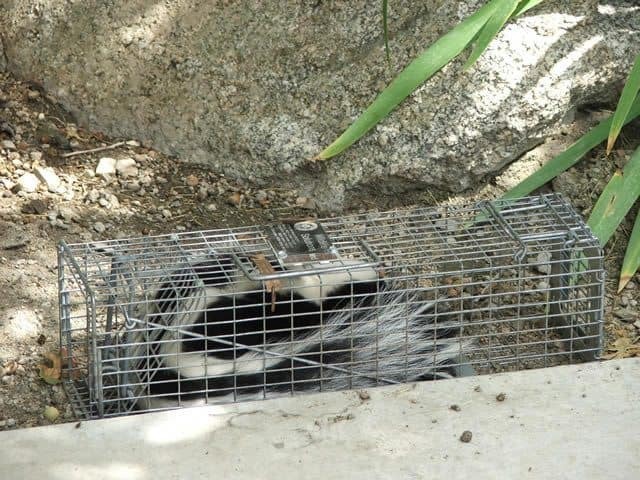 The live trap is one that secures the skunk without having to take its life. This is best if you simply want to capture the small animal and relocate it. While the kill trap is designed to kill the skunk by either using the suffocation method or simply by severe bodily harm. Choose a weapon that is small caliber. Why? Because skunks, when completely grown, weigh only a couple of pounds. So the smaller the caliber of your weapon, the less damage to the skunk as a whole. It doesn’t matter if your shot is carefully placed or not, the skunk will still spray a little even after you make the kill. 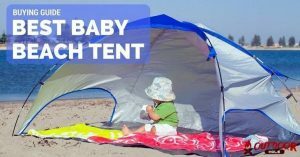 And that is why it’s a great idea to wrap or tarp the small animal real good before you even think of moving it from one place to another. It’s always better to be safe than sorry, right? In the skunk hunting season, these nocturnal animals tend to be very active right from dusk and up until dawn. They reside in the burrows found underground or below sheds or underneath any other surrounding outbuildings. And this is the best part about skunk hunting. The fact that one knows where exactly to look for these small animals is what makes learning to hunt skunks a much easier task. But if you don’t have or can’t spot any potentials burrows or holes that might be housing a skunk, then it’s time to use a different method. And that’s testing the air. This helps in knowing for certain if there are any skunks living around your neighborhood or not. 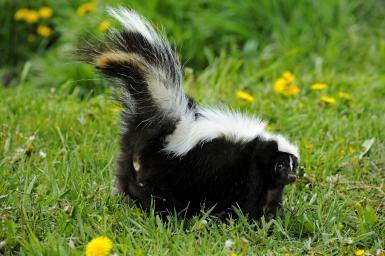 The smell of skunks is pretty distinct and unmistakable and has the capacity to travel long distances due to the wind. As soon as you spot a skunk in your area, the next step is to decide what kind of method you want to use to capture the nocturnal animal. If you simply want to kill it, then all you need to do is make use of a bait and wait it out until you finally make the kill. As I’ve already mentioned above, the most effective skunk bait is either cat food or sardines. So use either one as bait and be a little patient for the hunt to be successful. Skunk hunting tips and deer hunting tips have a lot in common, especially the part where you have to be extremely cautious about your presence and try your level best to camouflage it with the surroundings. Just remember that the more sound you make, the more distant the skunk will get from you. So the best way to hunt skunks is to be as silent as you can and, most importantly, well prepared. Hunters can also make use of traps when learning how to hunt skunks. But this method is considered to be very demanding. You have to well aware of your trap placement, the bait, and the location depending on the skunk in question. If you decide to use the kill trap, then the nocturnal animal will be ready to be tossed over in a couple of hours. On the other hand, if you decide to use the live trap, then you will have to put in some more efforts after a certain period of time. 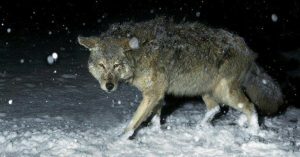 It doesn’t matter if you decide to use a bait or live trap because either way there will come a time where you will have to dispatch the animal. And when it comes to dispatching skunks, you should be well aware of the skunk’s capability to spray. They have the ability to spray for as long as at least 10 feet, which tends to travel even further if there’s any wind. So the next time you approach this nocturnal animal, be careful and aware of the spraying factor. Where To Shoot A Skunk? One of the most effective skunk hunting tips is to shoot the small animal right in the back of its head, just below the skull and above the spine. But there are a few other places to shoot a skunk that will undoubtedly help you achieve a successful kill. You can also aim at the juncture where the spine comes in contact with the hip region of the animal. Shooting right though the skunk’s lungs is also another effective target zone. The ultimate goal in this case is to take down the skunk in the most delicate manner. And why? Because that considerably reduces the chances of the skunk spraying even after it has been killed. Skunk hunting may not be such a difficult task for many hunters. But, nevertheless, let me still tell you that the best way to hunt skunks makes this easy task not only a little more challenging but also fun. Just remember that you need to position yourself carefully so as to avoid the possibility of coming in contact with the skunk’s spray. This needs to be kept in mind if you truly want to learn how to hunt skunks. So now do you think you’re ready for the skunk hunting season? Are you going to opt for the live or kill trap when dealing with skunks? Please leave a comment below letting us know what you think. 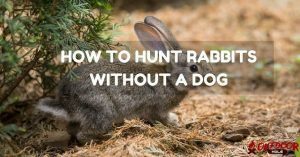 How to hunt rabbits effectively without a dog? 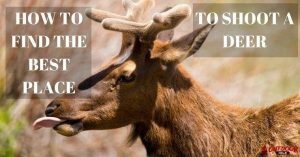 How To Find The Best Place To Shoot A Deer?